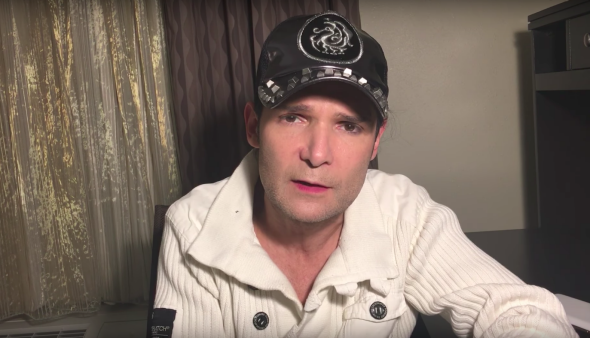 Corey Feldman seeks funding for film about Hollywood child abuse. Feldman says he’s ready to name names, but first he needs money both to fund a film and protect himself. Eighties child star Corey Feldman has launched a crowdfunding campaign for a movie about his life that will expose the pedophilia he says is rampant in Hollywood. Feldman, who has previously stated that he and Two Coreys co-star Corey Haim were preyed upon by older men in the entertainment industry, posted a video to Youtube along with a link to his campaign. As a security measure Corey has already written down the names and details of the events and given them to a trusted person of power, in case anything should happen to him or any member of his family before the film is finished. In the video, Corey indicates that he has at least six names to name, including one who is still powerful today, and can connect this pedophilia to a major Hollywood studio. I’m not able to name names. People are frustrated, people are angry, they want to know how is this happening, and they want answers—and they turn to me and they say, “Why don’t you be a man and stand up and name names and stop hiding and being a coward?” I have to deal with that, which is not pleasant, especially given the fact that I would love to name names. I’d love to be the first to do it. But unfortunately California conveniently enough has a statute of limitations that prevents that from happening. Because if I were to go and mention anybody’s name I would be the one that would be in legal problems and I’m the one that would be sued. While both women and children are vulnerable to abuse in Hollywood, pedophilia is a subject much less easy to broach. In an interview with the Guardian this week, Oscar-winning filmmaker Paul Haggis said that it’s problematic that the allegations of men like Corey aren’t taken seriously, while Molly Ringwald wrote a piece in the New Yorker about “All the Other Harvey Weinsteins,” who assaulted her as a young teen (including a 50-year-old crew member who pressed his erection against her as a 13-year-old). Despite disturbing allegations of pedophilia surrounding Woody Allen, A-listers continue to flock to him, many dismissing his stepdaughter’s very public claim that he abused her as a child as merely a story planted by an angry ex-wife.